Bald patches on cats: What are the reasons for them? Posted by Nurse Whiskers. May 7th 2016. Bald patches on cats are quite common and the problem can occur in many different forms. The loss of hair might be very clear, or just a thinning of the fur. It could just be one bald patch or a series of patches and it could be on different parts of the body. So, what causes hair loss in cats and how can you treat it? Why does my cat have bald patches? The reasons behind the appearance of bald spots can be wide-ranging. Unlike a parasite, ringworm is a fungal infection that causes circular lesions on the skin, where the hair will thin or disappear completely. Ringworm is highly contagious and it can be transmitted by direct contact with the fungal spores. These can live for up to two years, meaning your cat can catch it from any area an infected animal has visited. Ringworm can be detected by taking a swab of the skin and treatment typically involves using shampoos or other medication to restrict the growth of the fungus. Cats are keen self-groomers and take great pride in keeping themselves looking good by licking their fur regularly. They can, however, over-groom by licking too much too often or even biting at and chewing their own fur. This can result in the thinning of fur or complete bald patches, particularly on the front paws. In rare instances, over-grooming can be a sign of a neurological disorder, particularly in older cats but, more commonly, it is a behaviour triggered by stress. Just like when people feel like pulling their hair out, cats sometimes choose the soothing, comforting activity of licking their fur. The stress can be caused by a change in situation, such as the introduction of another pet to the home or moving to a different house. It’s important to try to prevent over-grooming becoming a habit because there’s a danger your cat will continue to do it even after he or she has come to terms with the initial trigger. One of the most effective ways to treat over-grooming in cats is by intervention. Whenever you notice your cat licking excessively or for a long period, try to interrupt. Perhaps play a game or offer a treat. Also, if you think your cat might be suffering from stress, go out of your way to devote more time and pay him or her a little bit more attention than normal in an effort to sooth them. Reactions caused by contact with an allergen can result in hair loss and other problems such as dry skin and blisters. Allergic reactions most commonly stem from the cat’s environment such as contact with plants. It is possible your cat will be allergic to some foods, so might need testing. If you have changed your cat’s diet and noticed hair-loss, then revert to the existing diet and contact your vet. 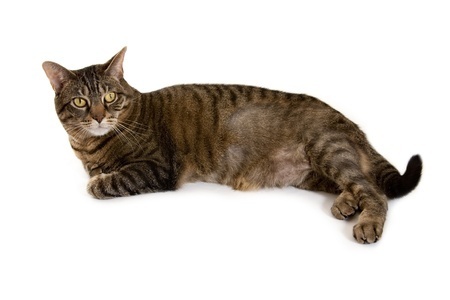 Parasites such as mites or fleas are the most common cause of bald spots in cats. Usually, the problem is caused by your cat suffering a reaction to the saliva of the flea and a localised reaction occurs, particularly on the back, towards the tail. 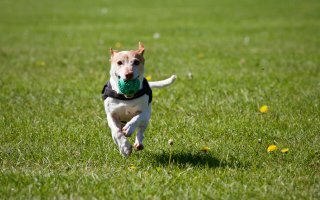 Fortunately, the problem is usually fairly easy to treat with medicated lotions and the hair will grow back as soon as the fleas or mites are gone. Watch our video below with vet Rebecca Cannon to help you with finding fleas on your cat. Thyroid problems in cats arise when the animal produces too much (hyperthyroidism) or too little (hypothyroidism) of the hormone. One of the symptoms is the development of bald patches. Hyperthyroidism and hypothyroidism can be detected using blood tests. Treating an overactive thyroid in cats is often quite straightforward, using medication prescribed by a vet, though, on rare occasions, surgery might be required. Some cats will lose hair because of a hereditary condition. There is no treatment for this but, usually the problem is sporadic and the hair will grow back within a few weeks. Cat owners should also be aware that some cats have naturally thinning hair, particularly on the tops of their heads or parts of their body they use to brush up against people and objects. This varies between breeds but is most noticeable in cats with dark fur and light skin. It is not usually an issue unless complete baldness occurs. Other factors that can lead to hair loss is pregnancy, leukaemia or a course of medical treatment such as chemotherapy. As ever, contact your vet if you have any pressing concerns. 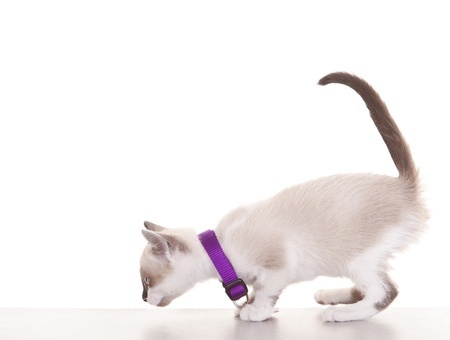 You can read more about cat health on our We Talk Cat blog. Make sure your cat is protected by having cat insurance. Visit www.argospetinsurance.co.uk for more information. Why does my dog lick and chew their feet?